When we focus our mind’s eye on what we’ve come to know as our self, we typically see a division between a misty constellation of biology, ideas and emotions that we embrace as our personal identity, and the rest of the outside world. This permeable and tenuous separation between our notion of “self” and “other” can quickly dissolve in an ideological solution of greater perspective. If we look through a different lens such as family, community, nation or species, our identity shifts from an isolated individual self, to part of a larger community. This membrane of identity can expand all the way up to include the recognition that we are an inseparable part of everything. The big Truth is; everything in the cosmos is inseparably related to everything else – a singular interdependent body of relationships – evolving over time – on a collective journey. When we realize that changing the abstract membrane we use to examine subsystems in the context of the whole cosmos, we see that this also changes our perspective. With this in mind, we can see that understanding the relationship between the level of abstraction we use as a lens, and what it reveals, is the key to deepen of vision of the interdependent nature of community threaded throughout the cosmos. 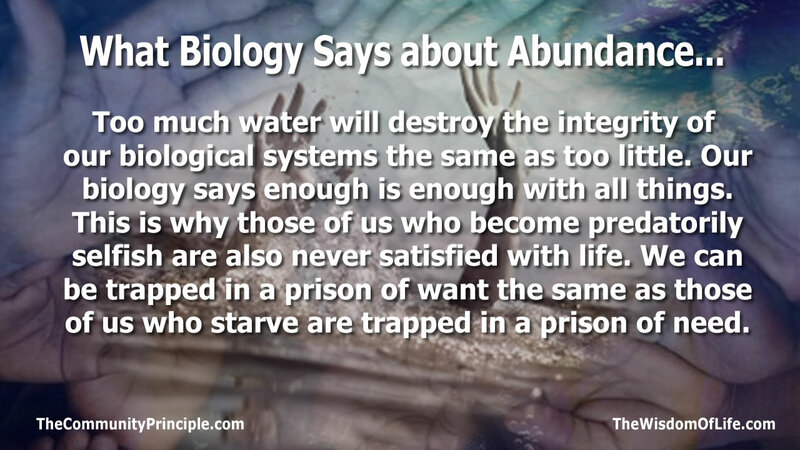 For instance; when we look at the earth level, we can see that we all swim in the same pond – a singular web of life in an earthen womb, dependent on nourishment from outside sources like the sun and other forces that umbilically nourish the earth with what we need to nourish and sustain our biological framework. We see that this womb model visible in earth as a whole is also expressed through our species and our individual biology – each ensconced in the other in successive interdependent layers. When we shift the layer of abstraction in our lens back up to the cosmos again, we see that everything is an expression of itself – that biology is an expression of the nature of the cosmos. The fact is; it could not be otherwise. It is for this reason that cultivating community through the expression of nourishing values in the context of the web of life we are both part of is the way we can cultivate a more fulfilled state of being. Expressing nourishing values in the context of community is the nature of our being. The organs in our body must nourish each other to maintain integrity and flourish. Harmony and/or disharmony with this native expression made through our biological system is a measure of our biological integrity. Our experience of life depends on harmony and/or disharmony with the communication made through our biology, this biology is a reflection of nature and a statement of who we are. 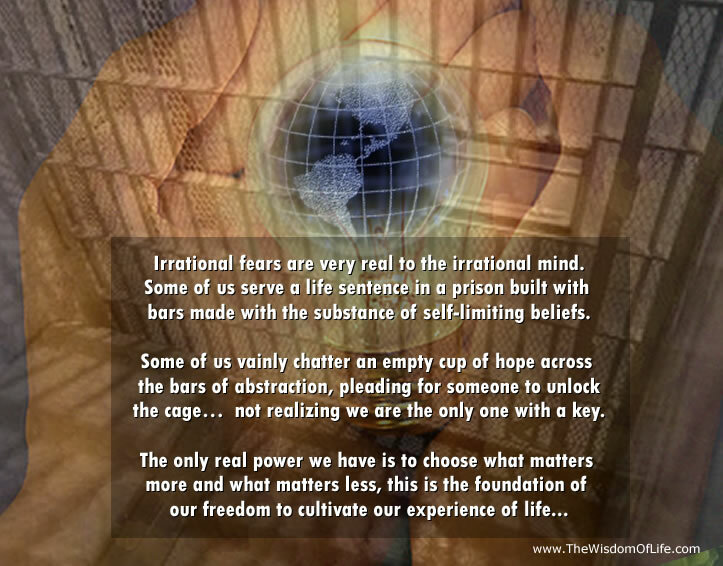 This same model of a seed within a seed applies to humans as a species – we are an organ in a larger body of life. The more we nourish the food web, the more nourishment is available throughout and the closer we can come to the realization of our full potential. This model also applies to personal relationships, business, institutions, governments and our collective relationship with the environment. This community aspect of relationships in our collective body is frequently lost in the heat of a moment, or in the apathy that rises from our ignorance of the fact that we exist in the context of a shared body of life. To diminish each other or any portion of this body, is to diminish our self. 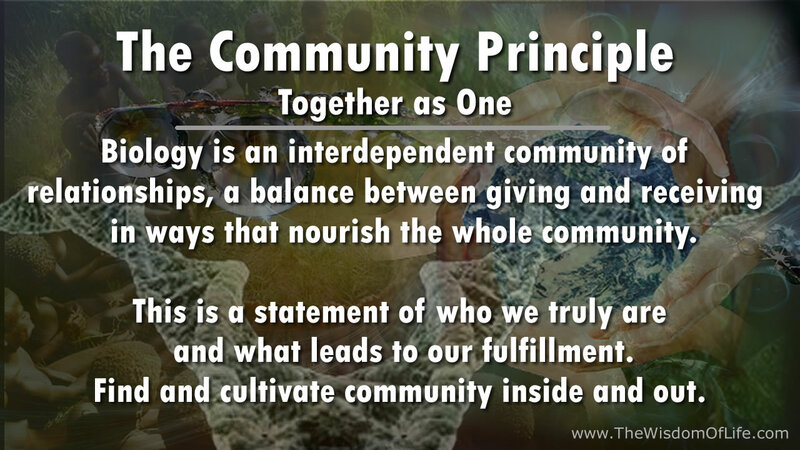 “The Community Principle” is based on the premise that biology is a language that communicates a strong need and preference for multidirectional cooperative relationships to thrive and realize its full potential. The realization of our fullest potential depends on how much our environment and our personal commitments cultivate nourishing community. The community principle applies to all human social relationships. The more our personal, business, institutional, environmental and governmental systems are aligned around this principle the more we contribute to the realization of our fullest potential. Commitment to community from the bottom up is the key. Top-down approaches burn up too much energy on compliance. We are at our best when we cultivate a commitment to community in everything we do. The more we harness our capacity to choose what we value the more we develop the capacity to make a difference in our own lives and the lives of those we touch. Taking too much from the social landscape, or giving too much are equally harmful. The enabler and the addict are examples of the destructive imbalance of giving and taking that can emerge and perpetuate themselves in human relationships. From a wide angle lens view the addict and the enabler are like the “tick and tock” sounds from the same relationship clock. The pendulum arc of this destructive relationship cycle swings through whole generations. Addict parents tend to produce enabler children who then spend their lives looking for unpleasable tyrants and impossible situations that they believe they need to please or solve. They think they failed because they’re not good enough when they finally collapse under the weight of the impossible. If the people in the enabler’s life are not demanding enough, they will project impossible demands on themselves in order to preserve their self-image as a failure. It is a recipe for frustration. Enabler parents tend produce addict children by catering to their every whim. Hovering over their children and cutting off crusts while dancing like clowns, enabler’s bury their kids in the expectation that other people are responsible to entertain and appease their ever growing whims. These people grow up to have great expectations for everyone else and when those people inevitably fail to meet the addicts suffocating demands and collapse, the addict is not capable of concern for the people they buried in service to them, they wonder why bad things happen to them and mad that the person who collapsed will no longer be there to serve them. This addict/enabler model is the systemic model of destructive giving and taking. Destructive taking can take on the form of narcissism or sociopathy, but the theme of destructive taking is a global tread that runs through them all. The same is true that destructive giving can take many forms. Some of these can create suffocating dependencies and the like. Not all destructive giving and taking falls into the addict/enabler model, but the idea here is to illustrate what happens when giving and getting become imbalanced. It has a tendency to propagate the imbalance, swinging back and forth in an eratic wave pattern. When we look for what to address in our lives or our world, balance is the key to understanding. Creative imagination is the mature form of a fully developed curiosity. Boredom is a symptom of a mind suffering from a disease called asphyxiated curiosity. Boredom is when a person is unable to use the power of creative imagination to explore the existing world or make up whole new ones on the fly. Creative imagination is the mature form of a fully developed curiosity, but sadly many are starved of their full potential by the terrible scourge of asphyxiated curiosity. One of the leading causes of the disease today happens when children become trapped in rooms for years on end by authoritarian sanitized information dispensers where they are cruelly force fed information made useless because it is out of context. It answers no asked questions. To further the asphyxiation process along, they are then measured on how much of this disjointed information they retain. We all have an inborn hunger to be noticed. As surely as we need food and water, we need some kind of social connection. Many factors including our developmental environment determine whether or not we will cultivate healthy constructive relational bonds, or destructive ones. 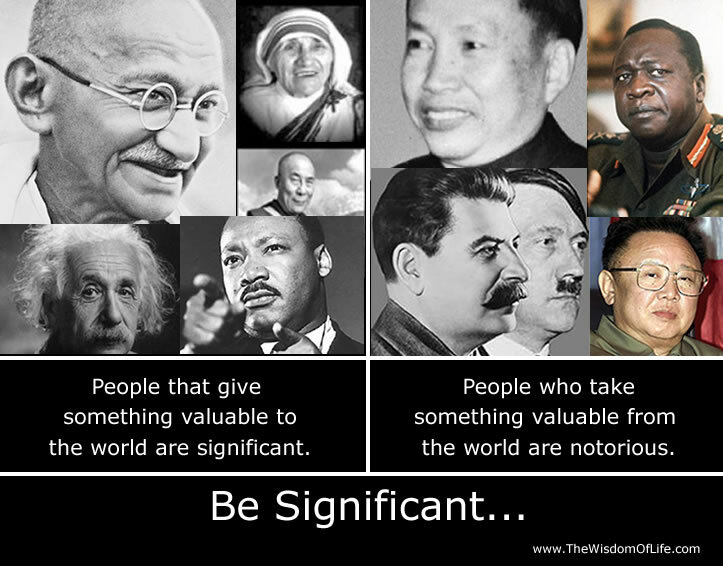 Those pictured as significant are as follows: Mahatma Gandhi, Mother Teresa, Dalai Lama, Albert Einstein and Martin Luther King Jr.
Those pictured as notorious are as follows: Pol Pot, Idi Amin, Joseph Stalin, Adolph Hitler and Kim Jong-Il.